The Willow Nook Tree House is the perfect luxury hideaway for spending quality time while relaxing and playing in comfort. 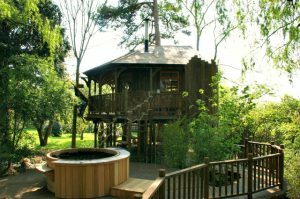 Hidden away in the client’s garden, the tree house sits raised near the feature hot tub, all of which are accessed via a wooden walkway. 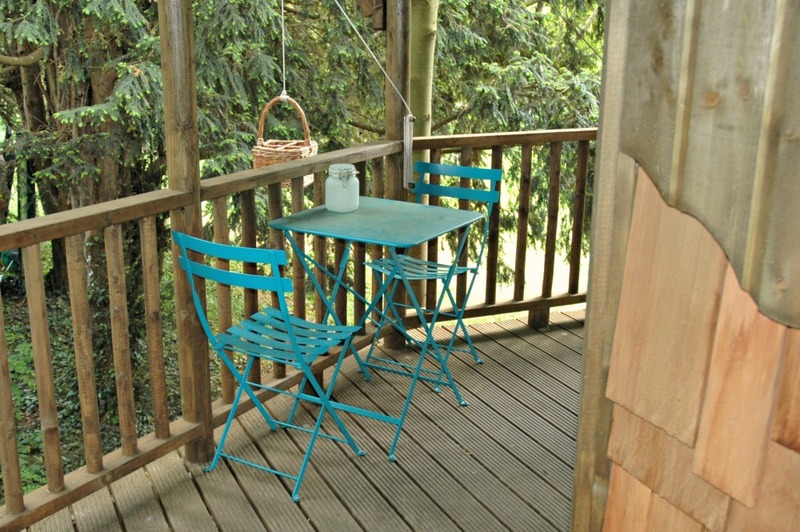 This unique setting, with the tree house partially hidden among the brightly coloured foliage of the garden, offers a rustic modernity and sense of privacy in a home away from home. Intimate family gatherings are what the Willow Nook Tree House was created for. 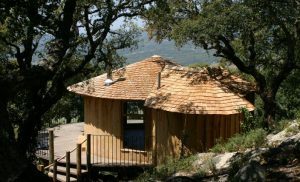 Offering a stylish and cosy place to rest, play games or watch a movie together, the tree house retreat boasts a considerable amount of space with open plan areas on the lower and upper decks. 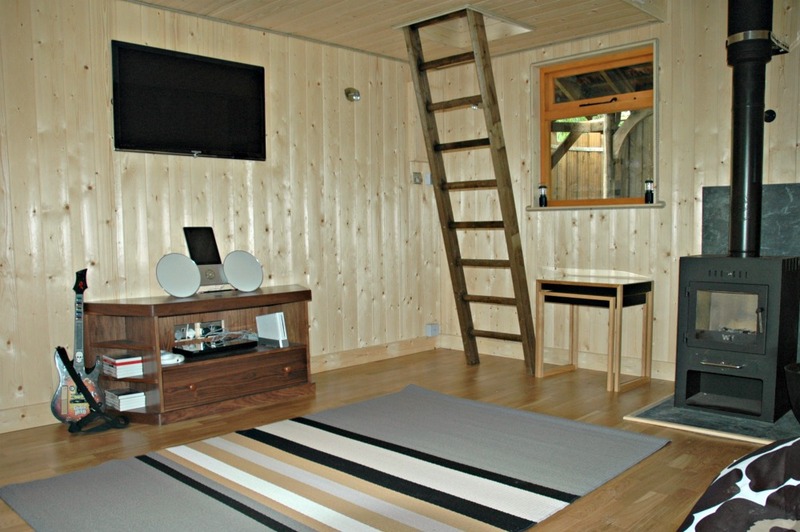 The clean and bright interior of the treehouse, with soft furnishings, TV and music system, is kept warm on cooler days and nights with a cosy log burner on one side of the main room. The wonder of a log burner is that not only does it provide heat but it entices visitors to relax, settle in and give them something naturally captivating to watch. 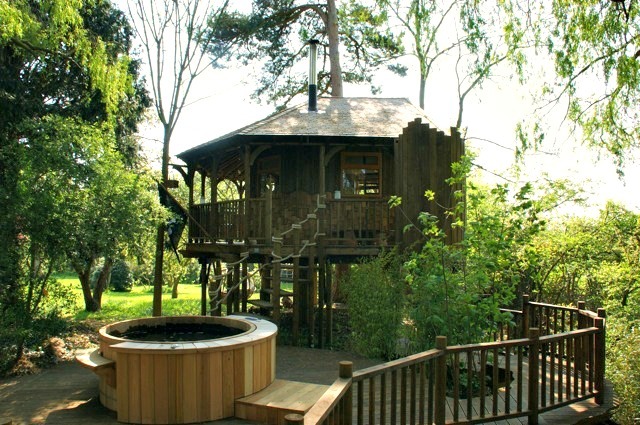 The tree house itself is primarily accessed by a spiral staircase. 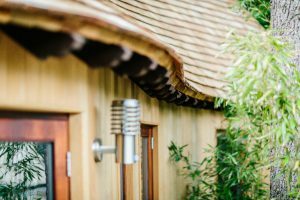 The exterior of the building is finished with a combination of cedar shingles in three different treatments, and softwood tongue and groove timber lining to create a tough, yet tidy and textured appearance. For the spiral staircase, Blue Forest have constructed a solid frame of substantial, rough hewn, softwood timber treads. The staircase features large rope handrails made from Polyhemp rope – known for its durability and resistance to discoloration – on a gentle stair rise for easy access to the upper floor. Rounded posts have been used to construct a strong, safe barrier around the edges of the decks. Evenly spaced, rustic timber spindles, supported by a solid timber handrail, offer a practical safety rail while maintaining the aesthetic of the tree house build. 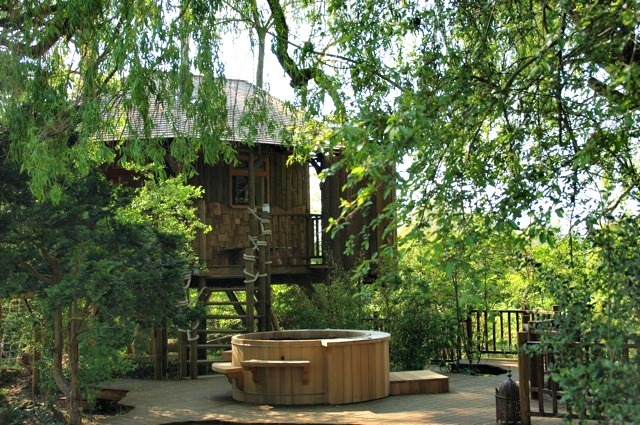 Outside this warm tree house abode, the spacious decking overlooks the cedar hot tub area, with the staircase leading down to a semi circle space. From here, a decked walkway runs around the side of the garden and leads back to the client’s main house. 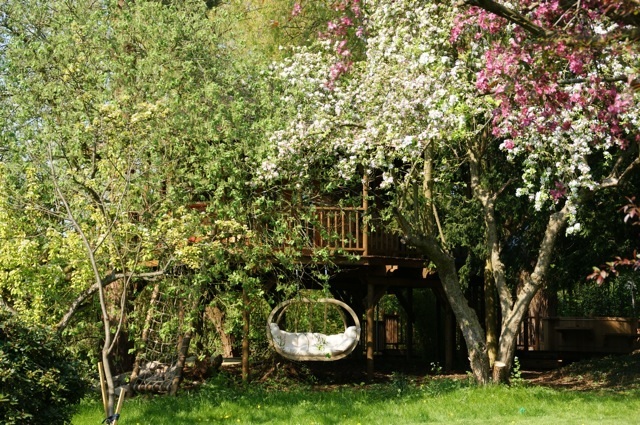 Both the upper treehouse and the lower deck are built in and amongst the trees, with one tree forming the centre part of the tree house. 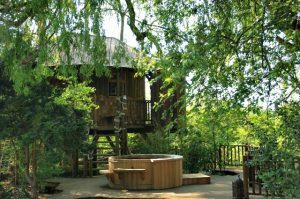 Tall shrubs and bushes shade the hot tub, allowing the whole structure to blend into the background and creating an idyllic garden hideaway. 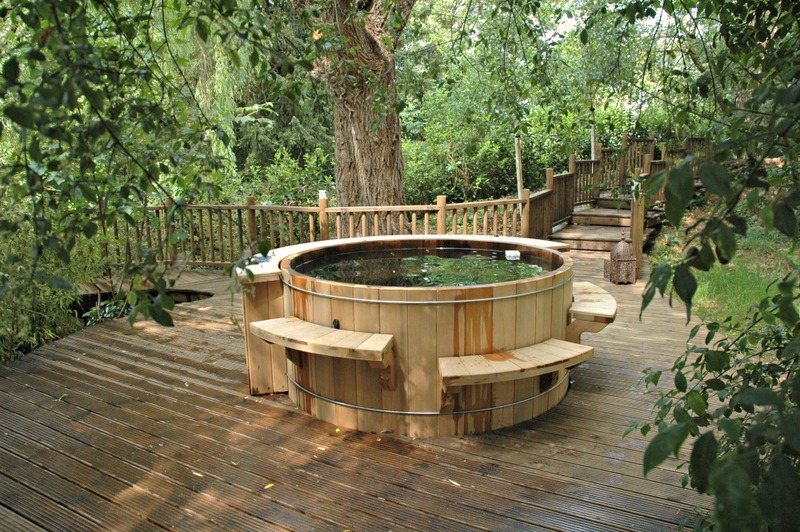 The hot tub is primarily set aside for use by the adults of the family, but is a great feature for the kids too. 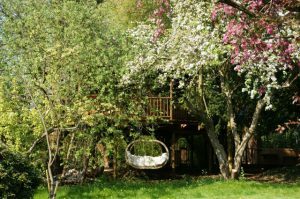 To keep the younger children occupied, while the others relax, the rear of the treehouse has an adventurers rope scrambling net and swing – which could double as a romantic spot to sit peacefully in as the sun sets. 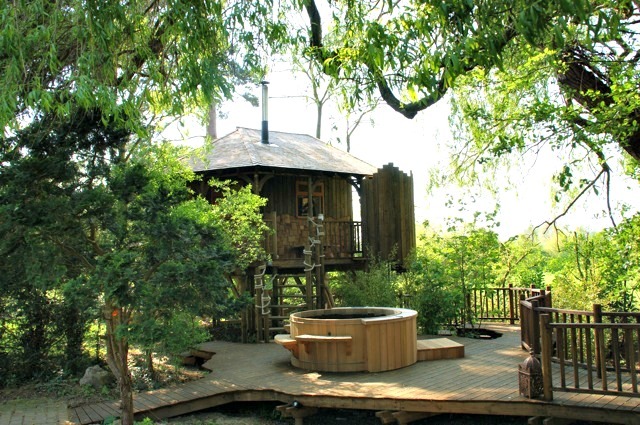 Blue Forest has endeavoured to create a truly unique treehouse, the Cedar Lodge, with plenty of space to grow into. It was built for adventurous play but in 10 years time could be a great party venue, a place to entertain friends or a quiet corner to revise for exams! This pool view treehouse is the ultimate relaxed party venue--the perfect place for family BBQs and for teens and young adults to hang out with friends.